Bill Werthmann, Sue Sohnle, Terry Fannon and support driver, Al Carlson. 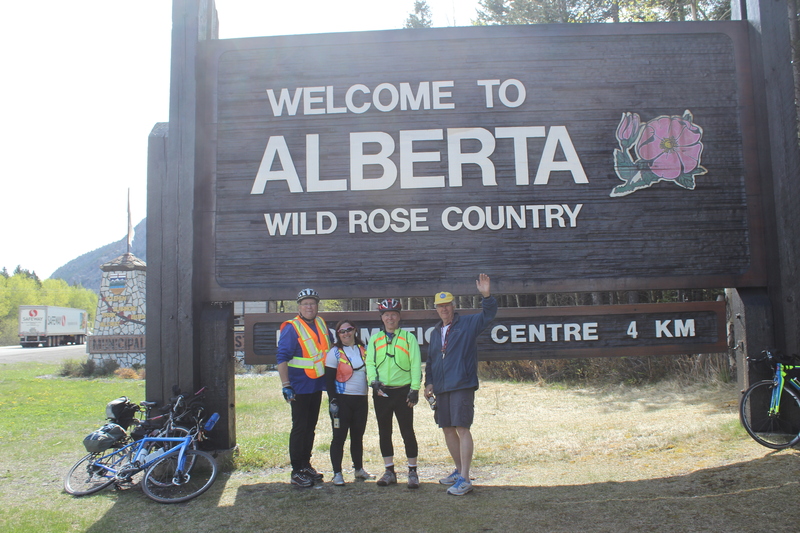 As the riders rolled into Alberta on Saturday (May 18), Chris Davis from The Pincher Creek Voice tracked them down, and had a brief chat to a couple of the riders. It was a big day for other media too, as Allison Brock from the Alberta-wide radio station, CKUA, also met up with the riders, and gave them all some encouraging words. Tune in to CKUA’s Wide Cut Country on Saturday (Oct 13th) with Allison Brock. Our friend, Rod McMillan, has sponsored an hour of programming and dedicated it to Hillary’s Ride. Bill & Alison had a good chat about the Ride this week. Check www.ckua.com for your local station or listen on the web.